Consider the use case that multiple AWS resources are running to support applications running on AWS. (We shall mainly be concerned with the AWS databases RDS, Redshift, and DynamoDB.) An administrator would be interested in finding out if the applications are running at the desired configurations. While it is possible to navigate to the AWS Management Console for each database and find out about configuration settings, a tool that monitors and records configurations on all AWS resources for continuous evaluation would be most desirable. AWS Config is such a tool. Using AWS Config, an administrator is able to perform the following configurations related tasks. Set desired configurations for AWS resources and let AWS Config automatically discover and evaluate the actual recorded configurations in comparison to the desired configurations. AWS Config has the provision to codify compliance with custom Config rules in AWS Lambda. Integration with other AWS services. Configuration changes are streamed to Simple Notification Services (SNS). The compliance may be codified with custom settings using AWS Lambda. Configuration changes are saved in AWS S3. The typical methodology used by AWS Config is as follows. AWS Administrator sets the desired configurations for the AWS resources being used. Configuration changes are made or occur automatically in AWS resources. AWS Config discovers the configuration changes and records them in a normalized format. Normalized changes are stored in S3, sent to Topic/s and Subscriptions configured in Simple Notification Service (SNS). Config evaluates the actual recorded configurations with the desired configurations. Evaluations are made available on the Config Dashboard and may also be sent to SNS topics and subscriptions. Config APIs are also available to access the normalized changes and evaluations made by Config. AWS Config provides managed rules that are used to evaluate AWS resources. AWS Config managed rules are provides in several categories: Compute (AMIs, EC2, and EBS), Database (DynamoDB, RDS, and Redshift), Management Tools (CloudTrail, CloudWatch), Security (IAM), and Storage (S3). Custom Config rules, which may extend managed rules already available, may also be defined. In this article we shall discuss using AWS Config to monitor configurations of databases on AWS and make evaluations and compliance auditing of the configurations. This two-article series has the following sections. The only prerequisite is an AWS account, which may be created at https://aws.amazon.com/resources/create-account/ . Open the AWS Config Console at https://aws.amazon.com/config/ and select Settings in the margin as shown in Figure 1. Recording is on by default. The Turn off button is provided to turn off the recording. By default Resource types to record is set to All resources, as shown in Figure 1. Select or create an Amazon S3 bucket to store configuration history and snapshot files with details for the resources that AWS Config records. Choose the config-bucket- prefixed bucket as shown in Figure 2. In Amazon SNS Topic choose the option Stream configuration changes and notifications to an Amazon SNS topic as shown in Figure 3. Select the option Choose a topic from your account and select the Topic name config-topic. Select the option Choose a role from your account to grant AWS Config read-only access to AWS resources so that it may record configuration changes, and also grant Config permissions to send the configuration information to S3, as shown in Figure 4. Select the Role name config-role-us-east-1; the role name could be different for different users. Click on Save. The AWS Config Settings get saved, as shown in Figure 5 by the Success message. Next, create AWS database resources on which to record the configuration changes. Create a few RDS Database instances, a DynamoDB instance and a Redshift instance. Within RDS some of the configurations are different for the different RDS engine types. Select from the different type of RDS Engines as shown in Figure 6. Also, configurations are different for the different editions of an RDS Engine. 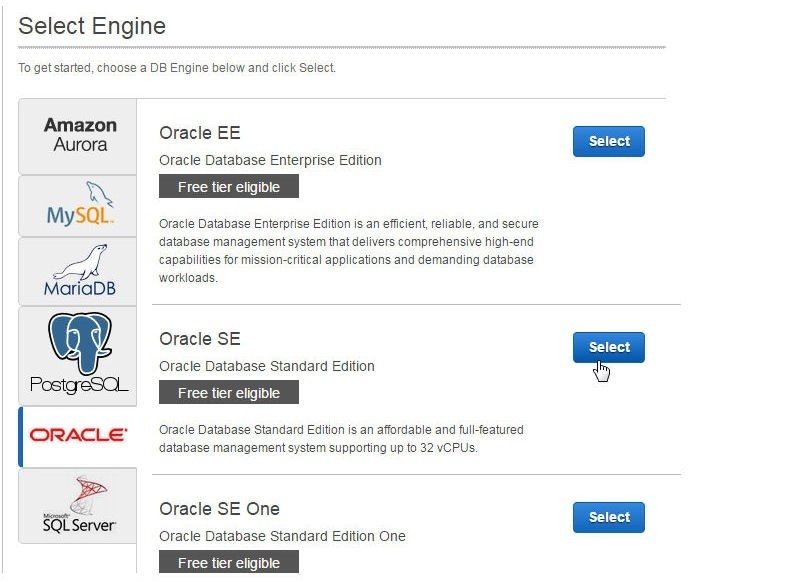 As an example, the configurations are different for the different editions of Oracle Database: Oracle EE, Oracle SE, and Oracle SE One, as shown in Figure 7. The configurations are also different based on whether Production or Dev/Test is selected as the deployment mode, as shown in Figure 8. 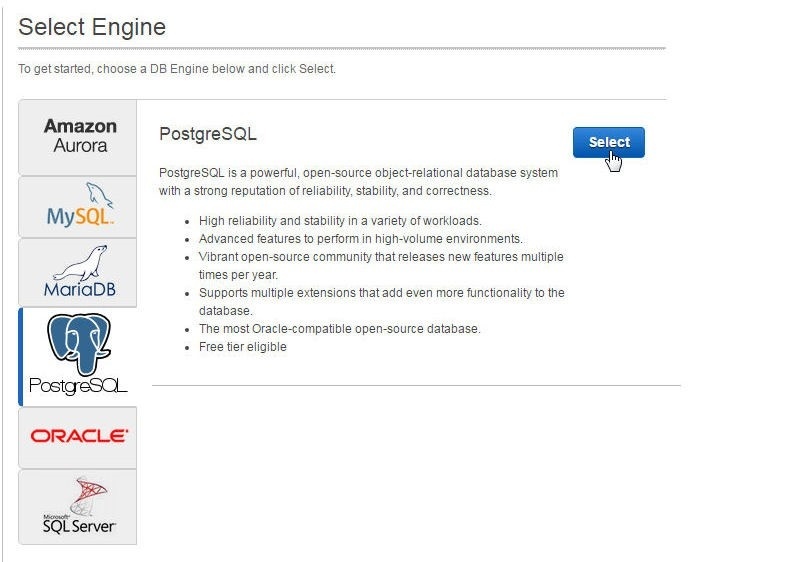 RDS Console with an Aurora DB cluster and replica, two Oracle DB instances, and a MySQL DB instance is shown in Figure 9. Different users may have different RDS databases. Create a DynamoDB instance in the DynamoDB Console as shown in Figure 10. Create a Redshift Cluster as shown in Figure 11. The procedure to create a Redshift cluster is discussed in an earlier article on using Redshift. AWS Config is used for evaluating compliance of AWS services with the configured settings. In this article we introduced AWS Config and set the environment by creating database instances for RDS, Redshift and DynamoDB. In a subsequent article we shall add AWS Config rules to evaluate databases.